The music for Legion is indeed appropriately dark and atmospheric. Eschewing woodwinds and trumpets entirely, Frizzell’s soundscape is gripping and driven, pushed forward by crashing cymbals and frantic strings. From the pulsing vocal chants at the end of the opening track (“When I Was A Little Girl”) to the gentle piano in the final track (“You Are the True Protector”) Frizzell’s score carries dramatic purpose throughout it’s 51 minute running time. Employing a new concept he calls “frozen sounds” which involves “taking one or two second audio files of different instruments and stretching them to 30 seconds or more using various audio processing software” Frizzell paints a sonic picture that is both electronic and yet eerily expressive. In the creeping tension of “This Is Not a Test” and the slow dramatics of “Percy’s Story” these “frozen sounds” create an ideal sense of mounting pressure. Director Scott Stewart thinks the “true test of the quality of any motion picture score is if it not only serves as an integral part of a film but can also be enjoyed on its own as a complete musical work without being married to a picture.” Held to that standard John Frizzell’s work on Legion can easily be called a success. Like most thrilling scores it can feel a bit repetitive at times, as the action rises and falls and then jump-starts yet again, but with quiet emotional interludes such as “I Didn’t Even Want This Baby,” a track carefully anchored by a tinkling piano, this collection of music manages to avoid the trap of focusing too much energy on shocking listeners out of their seats. That being said, it is a bit unnerving that the opening notes in the very next track (“Open the Door”) are explosive in nature, but hey, there’s no time to sit around tapping a piano when a horde of angels is out to kill you. 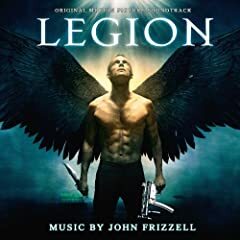 No user commented in " Music Review: Legion – Original Motion Picture Soundtrack, music by John Frizzell "